Pasta Primavera is a quick and easy supper. Perfectly cooked pasta with crisp green vegetables, sautéed onions and fresh baby tomatoes mixed together with a little creme fraîche and lemon zest. Spring in a bowl, quite literally as Primavera translate to ‘in the style of Spring’.! On my phone I keep track of the weather in all the places I or my children call home. That means I keep tabs on Santa Clara (Kat), San Fransisco (Andrew), Darien in Connecticut, London, Banff in the Northeast of Scotland and obviously Copenhagen. The next day you wake up to this! and I can now walk Fraser without wearing a hat! The first time I came across this dish was when the lovely Peggy Raleigh asked me to make it for the Darien Community Association’s Woman’s Group Lunch, back in the days when I was playing at being a caterer. Peggy had eaten the Pasta Primavera in a restaurant in New Canaan, and had been so impressed by the dish she wanted to serve it at the next lunch. She even very kindly brought me a recipe to use. 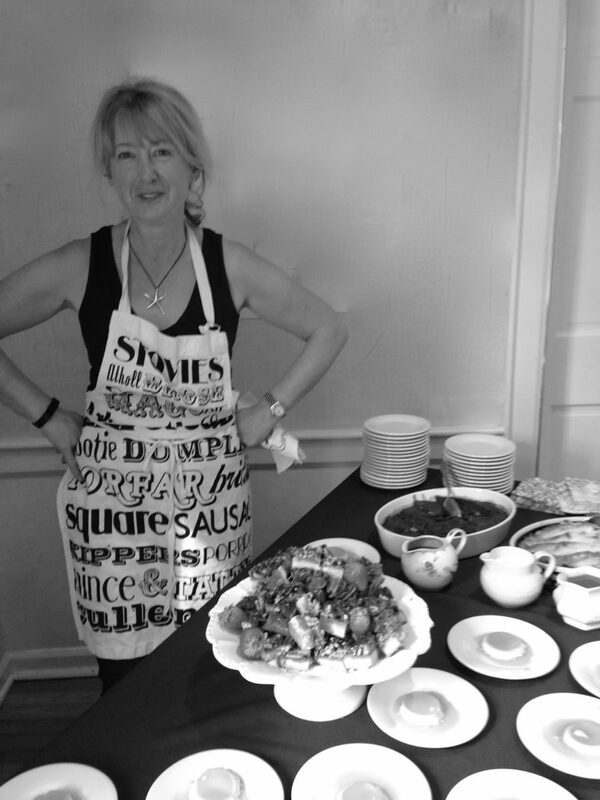 I loved catering the woman’s group lunches, I loved the team of wonderful ladies who came to set the tables and help me out in the kitchen. The lunch itself was always a bit stressful. We served the food pretty much at 12.30, on the dot. Regardless of numbers, I had to plate everything and have it ready to be served immediately. Now I think I have made it clear that I am not a trained chef so most days I was really just winging it, looking back I am not quite sure how I did it. Not too tricky when it was something like a salad. However Pasta Primavera is a meal which does not sit well for a long time. The pasta should be just cooked and the vegetables beautifully crisp and crunchy. A little hard to do for 60 people or what ever the number was that day. I suspect some of the pasta was overcooked and I am sure some of the broccoli was a little soggy so I am sending my apologies now. If you are using dried pasta the quantities per person are 3-4 ounces, or around 75-100g. I am going to give a recipe which should give you four generous portions. As I dislike washing up and like living dangerously I add my broccoli and other green vegetables to the boiling pasta, a few minutes before it is ready. Pasta takes around 9-11 minutes. Test it around 9 minutes and if it is nearly ready throw in the broccoli, as it needs the longest, say three minutes. You want vegetables like asparagus to have a lot of bite so I suggest only cooking it for two minutes. If you are using mange tout or sugar snaps throw then into the water just at the end, and drain the pasta straight away. Feel free to cook the vegetables separately, as they can be precooked and simply reheated when the pasta is ready. Just watch you do not overcook them in the process. I sauté the red onions and courgettes/zucchini in a large frying pan/skillet with a little olive oil. Since I regard olive oil as a health food I do not feel too guilty about the extra calories. Pasta Primavera can be enjoyed on its own but I like to add a little protein. Grilled chicken breast or pork tenderloin would be my suggestions. Of course I am very fortunate that Alan, my husband is brilliant at grilling. My speciality is rubber chicken, so I always defer to him. Alan seems to produce perfect results each time. He uses a thermometer, which with chicken is the way to go. It needs to reach 165F/75C to make sure it is safe to eat. As with all pasta a little crusty bread would be lovely too! Pasta Primavera is a quick and easy supper. Perfectly cooked pasta with crisp green vegetables, sautéed onions and fresh baby tomatoes mixed together with a little creme fraîche and lemon zest. Spring in a bowl, quite literally as primavera translate to 'in the style of Spring'. Step 1 Bring a large pan of salted water to boil. Add a little olive oil to the water then add the pasta. Step 3 Three minutes before the pasta is due to be ready add the broccoli. Step 4 Two minutes before the pasta is due to be ready add the asparagus. Step 5 Just before draining the pasta add the peas or sugar snaps. Step 6 Once every is cooked, drain the pasta, reserving a little of the pasta water for the sauce. Step 7 While the pasta is cooking, heat a little of the olive oil in a large frying pan or skillet. Step 8 Gently saute the red onion for a few minutes then add the courgettes (zucchini). Once the vegetables are nearly cooked turn up the heat to give then a caramelized finish. Step 9 Return the cooked pasta to the large pan, together with all the vegetables. Step 10 Stir in the creme fraîche and lemon zest, adding a little of the reserved pasta water if it seems to dry. Step 11 Heat gently, being careful not to over cook the creme fraîche, then add the baby tomatoes and fresh herbs. Step 12 Serve with freshly grated parmesan! Of course every time I think of the phrase ‘Spring is is the Air’, I immediately hear the song ‘Love is in the Air’ in my head. Found this great Youtube clip, singing and dancing, doesn’t get better than that!